It cannot be the task of this book to discuss the problem of social cooperation otherwise than with rational arguments. But the root of the opposition to liberalism cannot be reached by resort to the method of reason. This opposition does not stem from the reason, but from a pathological mental attitude—from resentment and from a neurasthenic condition that one might call a Fourier complex, after the French socialist of that name. The Fourier complex is much harder to combat. What is involved in this case is a serious disease of the nervous system, a neurosis, which is more properly the concern of the psychologist than of the legislator. Yet it cannot be neglected in investigating the problems of modern society. Unfortunately, medical men have hitherto scarcely concerned themselves with the problems presented by the Fourier complex. Indeed, they have hardly been noticed even by Freud, the great master of psychology, or by his followers in their theory of neurosis, though it is to psychoanalysis that we are indebted for having opened up the path that alone leads to a coherent and systematic understanding of mental disorders of this kind. Scarcely one person in a million succeeds in fulfilling his life’s ambition. The upshot of one’s labors, even if one is favored by fortune, remains far inferior to what the wistful daydreams of youth allowed one to hope for. Plans and desires are shattered on a thousand obstacles, and one’s powers prove too weak to achieve the goals on which one has set one’s heart. The failure of his hopes, the frustration of his schemes, his own inadequacy in the face of the tasks that he has set himself—these constitute every man’s most deeply painful experience—they are, indeed, the common lot of man. There are two ways in which man can react to this experience. Because not all my budding dreams have blossomed? Who does not daily win them anew. Such a will and such a spirit cannot be vanquished by any earthly misfortune. He who accepts life for what it is and never allows himself to be overwhelmed by it does not need to seek refuge for his crushed self-confidence in the solace of a “saving lie.” If the longed-for success is not forthcoming, if the vicissitudes of fate destroy in the twinkling of an eye what had to be painstakingly built up by years of hard work, then he simply multiplies his exertions. He can look disaster in the eye without despairing. The neurotic cannot endure life in its real form. It is too raw for him, too coarse, too common. To render it bearable he does not, like the healthy man, have the heart to “carry on in spite of everything.” That would not be in keeping with his weakness. Instead, he takes refuge in a delusion. A delusion is, according to Freud, “itself something desired, a kind of consolation”; it is characterized by its “resistance to attack by logic and reality.” It by no means suffices, therefore, to seek to talk the patient out of his delusion by conclusive demonstrations of its absurdity. In order to recuperate, the patient himself must overcome it. He must learn to understand why he does not want to face the truth and why he takes refuge in delusions. Only the theory of neurosis can explain the success enjoyed by Fourierism, the mad product of a seriously deranged brain. This is not the place to adduce evidence of Fourier’s psychosis by quoting passages from his writings. Such descriptions are of interest only to the psychiatrist and, perhaps, also to people who derive a certain pleasure from reading the productions of a lewd phantasy. But the fact is that Marxism, when it is obliged to leave the field of pompous dialectical rhetoric and the derision and defamation of its opponents and to make a few meager remarks pertinent to the issue, never has anything different to advance from what Fourier, the “utopian,” had to offer. Marxism is likewise unable to construct a picture of a socialist society without making two assumptions already made by Fourier that contradict all experience and all reason. On the one hand, it assumes that the “material substratum” of production, which is “already present in nature without the need of productive effort on the part of man,” stands at our disposal in such abundance that it need not be economized; hence the faith of Marxism in a “practically limitless increase in production.” On the other hand, it assumes that in a socialist community work will change from “a burden into a pleasure”—indeed, that it will become “the primary necessity of life.” Where a superfluity of all goods abounds and work is a pleasure, it is, doubtless, an easy matter to establish a land of Cockaigne. Marxism believes that from the height of its “scientific socialism” it is entitled to look down with contempt on romanticism and romantics. But in reality its own procedure is no different from theirs. Instead of removing the impediments that stand in the way of the realization of its desires, it too prefers to let all obstacles simply fade away in the mists of phantasy. In the life of the neurotic the “saving lie” has a double function. It not only consoles him for past failure, but holds out the prospect of future success. In the case of social failure, which alone concerns us here, the consolation consists in the belief that one’s inability to attain the lofty goals to which one has aspired is not to be ascribed to one’s own inadequacy, but to the defectiveness of the social order. The malcontent expects from the overthrow of the latter the success that the existing system has withheld from him. Consequently, it is entirely futile to try to make clear to him that the utopia he dreams of is not feasible and that the only foundation possible for a society organized on the principle of the division of labor is private ownership of the means of production. The neurotic clings to his “saving lie,” and when he must make the choice of renouncing either it or logic, he prefers to sacrifice logic. For life would be unbearable for him without the consolation that he finds in the idea of socialism. It tells him that not he himself, but the world, is at fault for having caused his failure; and this conviction raises his depressed self-confidence and liberates him from a tormenting feeling of inferiority. Just as the devout Christian could more easily endure the misfortune that befell him on earth because he hoped for a continuation of personal existence in another, better world, where those who on earth had been first would be last and the last would be first; so, for modern man, socialism has become an elixir against earthly adversity. But whereas the belief in immortality, in a recompense in the hereafter, and in resurrection formed an incentive to virtuous conduct in this life, the effect of the socialist promise is quite different. It imposes no other duty than that of giving political support to the party of socialism; but at the same time it raises expectations and demands. This being the character of the socialist dream, it is understandable that every one of the partisans of socialism expects from it precisely what has so far been denied to him. Socialist authors promise not only wealth for all, but also happiness in love for everybody, the full physical and spiritual development of each individual, the unfolding of great artistic and scientific talents in all men, etc. Only recently Trotsky stated in one of his writings that in the socialist society “the average human type will rise to the heights of an Aristotle, a Goethe, or a Marx. And above this ridge new peaks will rise.”1 The socialist paradise will be the kingdom of perfection, populated by completely happy supermen. All socialist literature is full of such nonsense. But it is just this nonsense that wins it the most supporters. One cannot send every person suffering from a Fourier complex to the doctor for psychoanalytic treatment; the number of those afflicted with it is far too great. No other remedy is possible in this case than the treatment of the illness by the patient himself. Through self-knowledge he must learn to endure his lot in life without looking for a scapegoat on which he can lay all the blame, and he must endeavor to grasp the fundamental laws of social cooperation. In recent years, I have given a number of presentations to high-school and college students on the importance of economic freedom and persistent threat of socialism – as witnessed, for example, by the recent economic meltdown in Venezuela. One problem that I have encountered is that young people today do not have a personal memory of the Cold War, let alone an understanding of social and economic arrangements in the Soviet bloc, which, I suspect are either downplayed or ignored in American school curricula. As a result, I have written a basic guide to socialist economics, drawing on my personal experience growing up under communism. I hope that this – somewhat longer piece – will be read by the millennials, who are so often drawn to failed ideas of yore. As a boy growing up in communist Czechoslovakia, I would, for many years, walk by a building site that was to become a local public health facility or clinic. The construction of this small and ugly square-shaped building was slow and shoddy. Parts of the structure were falling apart even while the rest of it was still being built. Recently, I returned to Slovakia. One day, while driving through the capital of Bratislava, I noticed a brand new suburb that covered a hill that was barren a mere two years before. The sprawling development of modern and beautiful houses came with excellent roads and a large supermarket. It provided a home, privacy, and safety for hundreds of families. How was it possible for a private company to plan, build, and sell an entire suburb in less than two years, but impossible for a communist central planner to build one small building in almost a decade? In a normally functioning market, it is rare for only one company to provide a certain kind of good or service. The people who bought the houses in the suburb that I saw did not have to do so. They could have bought different houses built by different developers in different parts of town at different prices. Competition, in other words, forces capitalists to come up with better and cheaper products – a process that benefits us all. All large privately held enterprises, like shoe factories and steel mills, were nationalized.Communists opposed both profit and competition. They saw profit-making as useless and immoral. In their view, capitalists did not work in the conventional sense. The real work of building the bridges and plowing the fields was done by the workers. The capitalists simply pocketed the company’s profits once the workers’ wages have been paid out. Put differently, communist believed that the capitalist class exploited the working class – and that was incompatible with the communist goal of a classless and egalitarian society. But capitalists are neither useless nor immoral. For example, capitalists often invest in new technologies. Companies that have revolutionized our lives, like Apple and Microsoft, received their initial funding from private investors. Because their own money is on the line, capitalists tend to be much better at spotting good investment opportunities than government bureaucrats. That is why capitalist economies, not communist ones, are the leaders in technological innovation and progress. Moreover, by investing in new technologies and by creating new companies, capitalists provide consumers with a mind-boggling variety of goods and services, create employment for billions of people, and contribute trillions of dollars in tax revenue. Of course, all investment involves at least some level of risk. Capitalists reap huge profits only when they invest wisely. When they make bad investments, capitalists often face financial ruin. Arbitrary terror, the communists believed, made the rest of the workforce more productive.Unfortunately, communists did not share the above views and banned private investment, private property, risk-taking and profit-making. All large privately held enterprises, like shoe factories and steel mills, were nationalized. A vast majority of small privately held enterprises, like convenience stores and family farms, were also taken over by the state. The expropriated owners seldom received any compensation. Everyone now became a worker and everyone worked for the state. In order to prevent new income inequalities and new classes from emerging, everyone was paid more-or-less equally. That proved to be a major problem. Since people did not make more money when they worked harder, few of them worked hard. The communists tried to motivate or incentivize the workforce through propaganda. Posters of strong and determined workers were ubiquitous throughout the former Soviet empire. Movies about hardworking miners and farmers were supposed to instill the population with socialist zeal. Propaganda alone could not increase the productivity of communist workers to Western levels. To incentivize the workforce, communist regimes resorted to terror. Workers who slacked off on the job were sometimes convicted of sabotage and shot. More often, they were sent to the Gulag – a system of forced labor camps. Sometimes, the authorities arrested and punished completely innocent people on purpose. Arbitrary terror, the communists believed, made the rest of the workforce more productive. In the end, tens of millions of people in the Soviet Union, China, Cambodia, and other communist countries were sent to labor camps. The living and working conditions in the camps were inhuman and millions of people perished. My great uncle, who was accused and convicted of being a supporter of the underground democratic opposition in communist Czechoslovakia, was sent to mine uranium for the Soviet nuclear arms program. Working without any protection from radiation, he died of cancer. By the late 1980s, communist regimes lost much of their revolutionary zeal. Terror and fear subsided, and productivity declined further. Thus, in the late 1980s, an average industrial worker in Western Europe was almost eight times as productive as his Polish counterpart. Put differently, in the same time and with the same resources that a Polish worker needed to produce $1 worth of goods, a Western European worker could produce $8 worth of goods. Just as they replaced the profit motive with propaganda and terror, so the communists replaced competition with monopolistic production. Under capitalism, companies compete for customers by slashing prices and improving quality. Thus, a teenager today can choose between jeans made by Diesel, Guess, Calvin Klein, Levi’s and many others. Communists thought that such competition was both wasteful and irrational. Instead, communist countries tended to have one monopolistic producer of cars, shoes, washing machines, etc. But, problems soon arose. Since producers in communist countries did not have to compete against anyone, they did not have any incentive to improve their products. 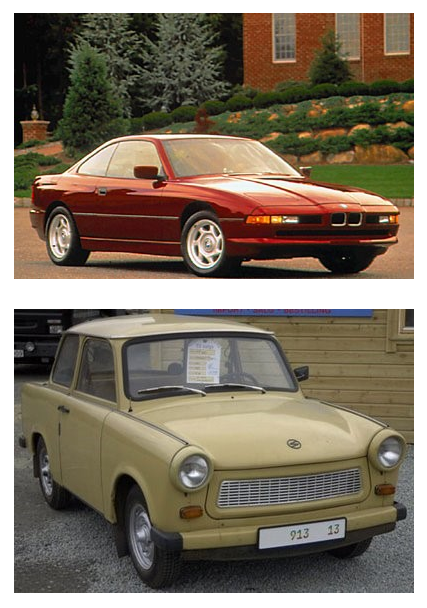 Compare, for example, the BMW 850 that went into production in West Germany in 1989 and the Trabant that was made in East Germany at the same time. Communist producers were protected from domestic competition by having a monopoly. They were also protected from foreign competition by prohibitively high import tariffs or an outright ban on imports. Put differently, they had a “captive” consumer base. The Trabant car manufacturer did not have to worry about losing consumers, since the latter had nowhere else to go. Moreover, the workers at the Trabant car plant received the same salary irrespective of the number of cars they produced. As a result, they produced fewer cars than were needed. People in East Germany had to wait for many years, sometimes decades, before they were able to buy one. Indeed, shortages of most consumer goods, from important items such as cars to mundane items such as sugar, were ubiquitous. Endless queuing became a part of everyday life. Under capitalism, shortages are generally avoided through the movement of prices. Some prices, like those of national currencies traded globally, change virtually every second. Other prices change more slowly. If there is a shortage of strawberries, for example, their price will rise. As a result, fewer people will be able to buy strawberries. On the upside, the people who value strawberries the most and are willing to pay the higher price will always find them. The movement of prices provides important information for the capitalists. Capitalists take their money and invest it in more profitable business ventures. If the price of something is rising, not enough of it is being produced. Investors rush in with new capital, hoping to make a profit. Production increases. The economy as a whole thus tends toward an “equilibrium” or a point at which capital is distributed roughly where it is needed. Communism started as a movement for greater equality. In reality, it was a return to feudalism.Prices are an important source of information, but where do they come from? In a capitalist economy, nobody sets prices. They emerge “spontaneously” in the market place. Every time I buy a cup of coffee on the way to work, for example, I incrementally increase the price of the coffee bean. Every time I fail to buy my usual morning cup of coffee because I am late for work, I decrease its price by a tiny amount. If everyone stopped buying coffee, its price would collapse. Communists banned profit, capitalists, competition, free trade and much (if not all) private property – all of which are necessary for accurate prices to emerge. Instead, tens of millions of prices for items ranging from tractors to a loaf of bread were set annually (or every few years) by government bureaucrats. Since they could neither accurately predict how much bread would be produced (i.e., supplied) nor how much bread would be consumed (i.e., demanded), the bureaucrats almost always got the prices wrong. Price-setting made shortages associated with low productivity worse. If the price of flour was set too high, bakeries would bake too little bread and bread would disappear from shops altogether. If the price of flour was set too low, too much bread would be baked and much of it would end up rotten. Put differently, communist economies were very inefficient. To complicate matters, communists sometimes mispriced items intentionally. The price of meat, for example, was kept too low year after year out of political considerations. Low prices created an impression of affordability. On their trips abroad, communist officials would often boast that the workers in the Soviet empire could buy more meat and other produce than their Western counterparts. In reality, shops were often empty. As a consequence, money was of limited use. To get around shortages, many people in communist countries resorted to bartering goods and favors (or services). Under communism, the state owned all production facilities, such as factories, shops and farms. In order to have something to trade with one another, people first had to “steal” from the state. A butcher, for example, stole meat and exchanged it for vegetables that the greengrocer stole. The process was inefficient, but it was also morally corrupting. Lying and stealing became widely used and trust between people declined. Far from fostering brotherhood between people, communism made everyone suspicious and resentful. Of course, not everyone was equally affected by shortages. Government officials and their families could generally avoid the daily hardships of life under communism by having access to special shops, schools, and hospitals. Communism started as a movement for greater equality. In reality, it was a return to feudalism. Like feudal societies, communist societies had an aristocracy composed of the communist party members. Like feudal societies, communist societies had a population of serfs with limited or no rights and little possibility of social mobility. Like feudal societies, communist societies were held together by brute force. I am sometimes asked why, if communism was so inefficient, it had survived as long as it did. Part of the reason rests in the brute force with which the communists kept themselves in power. Part of it rests in the emergence of smugglers, who made the economy run more smoothly. When, for example, a communist shoe factory ran out of glue, the factory manager called his contact in the “shadow” or “underground” economy. The latter would then obtain the glue by smuggling it out of the glue factory or from abroad. Smuggling was illegal, of course, but it was preferable to dealing with the government bureaucracy – which could take years. So, in a sense, communism’s longevity can be ascribed to the emergence of a quasi-market in goods a favors (or services).